The wrist is a joint that consists of two forearm bones called “radius and ulna” and 8 other small bones that can do the turning, twisting and bending movements. While for younger people, more commonly only severe injuries like falling onto the wrist or traffic accidents result in fractures, with osteoporosis, same fractures can be seen in the aftermath of less severe injuries. Fractures on the wrist are mostly seen at the ending of the radius bone. Contrary to popular belief, the symptoms of wrist fractures are not different from the symptoms of sprains. The most common symptoms are swelling on the wrist and pain felt with movement or while stationary. In radius fractures, a dinner fork deformity may occur in the wrist. This deformity is not seen in small bone fractures. What to do if a fracture is suspected? The wrist should be supported from the bottom with cardboard or a piece of wood and try to be immobilized. After reducing the swelling by applying ice to the swollen area, the nearest healthcare facility should be visited. Determining the right course of treatment depends on factors such as whether or not the fracture is displaced or segmental. The age, general health condition, occupation of the patient, and a preexisting condition of calcification in the wrist are also important factors in this decision. Treatment with a cast is possible in stable and non-segmental fractures. However, the fractures that are not stable but segmental will mostly require surgery. External or internal fixation methods can be used for surgery. In external fixation, plates can be placed to form a bridge between the hand and the forearm. Additionally, fractures can be reattached using screws. Plates can also be used for internal fixation. Sometimes a wrist arthroscopy can be performed for treatment. The method of treatment to be used will be decided by your doctor. On occasions when there is a gap in between the fracture ends, a graft may be needed. This graft is made by taking a piece of bone from another part of your body, frequently from the hip area. After surgery, as the fracture continues to heal, moving the fingers may ease the swelling and help with the physical therapy in the later stages. Thus, after the surgery, the fingers should be moved open as much as possible. When the fracture starts healing, wrist movements can also begin. Your doctor will decide the period needed before starting to move the wrist. The fracture takes four to eight weeks to heal. As wrist fractures are joint fractures, some patients may experience restriction of motion, calcification and pain in the fractured area. The tendons that lift the thumb and enable it to move away from the other fingers are located in a tunnel shaped like a sheath as they go through the wrist (the extensor pollicis brevis tendon and the abductor pollicis longus tendon). These tendons move by gliding inside the tunnel. The movement of the tendons inside the tunnel becomes difficult because of tendon swelling, thickening in the tunnel and fluid retention. It is first defined by Fritz de Quervain in 1895. It occurs because of recurrent traumas or fluid retention in the tendon stealth and thickening in the tunnel caused by griping movements. Especially, new mothers who hold their wrists in the wrong position while carrying or breastfeeding their babies and hormonal changes in women during the same period are the factors that increase the risk of this disorder. Pain in the area of the wrist closest to the thumb is the main symptom. 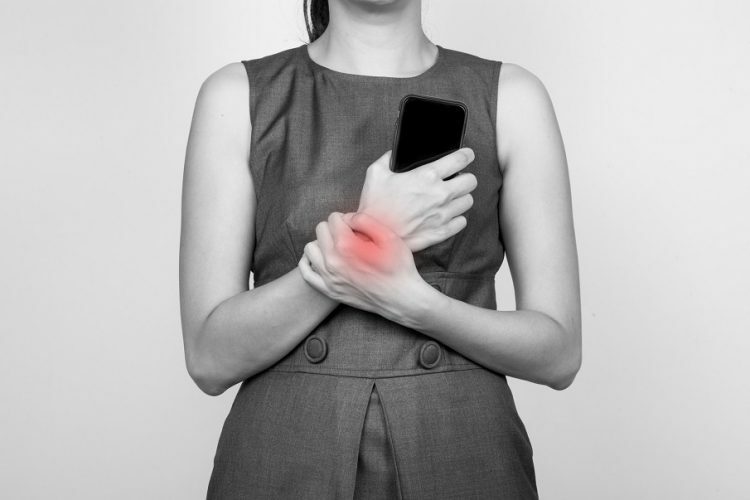 The pain increases when the thumb is pressed inside the palm and the wrist twisted towards the opposite direction. While resting, the pain may spread to the forearm. Swelling may accompany pain in that area. Diagnosis is made with an examination and taking ultrasonography after hearing the complaints of the patient. When needed, the patient is asked for an x-ray. In the early stages of Dequervain disease, the tendon is rested by using a splint and medication can be used for the pain control.It is recommended that the patient applies ice and avoids challenging movements that can cause pain. In cases when the patients’ pain cannot be managed, cortisone injections can be performed on the inside of the tunnel. For patients who continue to have complaints, a surgery to open the tunnel can be performed after giving the patient anesthesia from the armpit; this surgery will not require the patient to spend the night at hospital.